The boys will start school after Easter. They start nursery until the September after they turn 4. And in reception there is a two-form entry. I am undecided, for many reasons, on whether the boys should be in different classes. (would they be unnerved, what if one teacher is 'better' than the other- rather than one boy, one will know their class mates [they split by am/pm at nursery], why would I want to split them for the first time in their lives.... to name a few!). When the boys attended their open day, the school were eager to put me at ease. "We never refer to them as 'the twins." I never refer to them as 'the twins'. (And I know this grates on a lot of parents of multiples). For their first 18months, I referred to them as 'my babies'. And I only stopped because Seren insisted they weren't babies anymore. So, now they are 'my boys'. And how is that really different to 'twins'? So, that's not a priority to me. And I know that TAMBA have a great guide and questionnaire which I can offer to the nursery teacher, to help us decide what is best for Tom and Seb. And I guess that is it. They have been together long before I got to meet them. Separating them is a careful decision. My fear is underestimating them. We were proven wrong this weekend. We all went to a birthday party. A little boy's 3rd birthday, a boy the boys hold in high regard. It was a 'music tots' party. In my mind I knew which of 'my boys' would be up there getting involved. As Seb cwtched into me, I turned to Mr J, who was equally surprised. Tom was up there, banging musical instruments in time. Equally holding the light to his older sister. They love being in each others company. And, fortunately, equally, they are happy to spend time apart. They both have a strong bond with their sister- a completely different bond. Seb, is Seren. Their characteristics are so similar. Seb has taken to bed-hopping. A Seren trait. And for all the same reasons. Seb has the cheek, the wit, and the caring nature of Seren. Along with stubbornness. And on the whole, these two similar characters get on well. Tom, Tom does not have as many of those traits. My mum, my mum still places it on the week where Seb and Seren had each other for company, whilst Tom and I were in hospital. 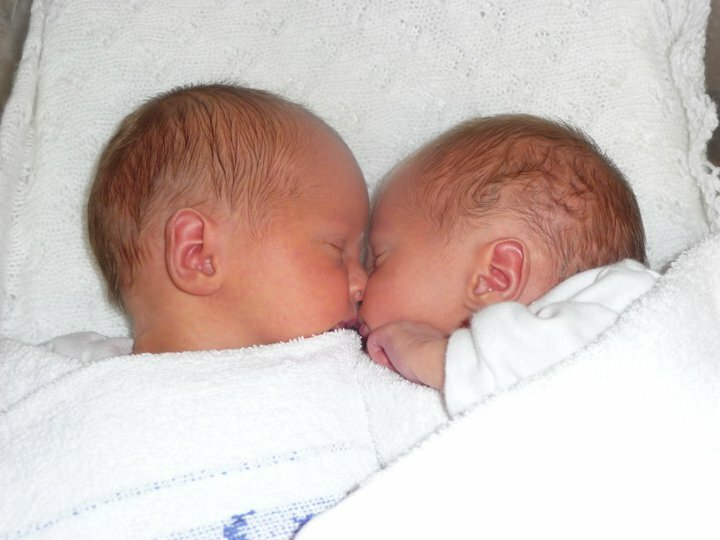 When Tom & Seb were 10 weeks old. Whilst I think it's a little far fetched, there is the fact than Tom always gets sick first, faster, and for longer. But he and Seb are very similar, in sense of humour, in understanding, in their frustrations and in their favourite things. Seren and Tom both get the faraway look. When the world stops around them, and they are still. And everyone else's world continues. My children are three individuals. Two of which happen to have the same birth date. And should the same birth date mean they have to live in each others pockets through school? Should they be allowed to demonstrate the same individuality as singletons if this is an option? Or is the bond, that as a singleton, I will never appreciate, the overriding consideration? I have volunteered to nursery school to dress one in blue and the other in white piques. My motives are that if on occasion (many) I cannot tell my non-identical twins apart, should I expect anyone else to. And yet, in doing so, I quiver, one of them will always know they are dressed differently to their peers. Unlike girls, where hairstyles could be the differential. And so, again I am in turmoil. And so, I hope, the next 15 months of nursery school will be enough. To gain more insight in how my boys, Tom & Seb, will progress, learning together. I love the picture of them sleeping together is beautiful:) I enjoyed reading your post. Thank you x There is such an innocence to be found when sleeping. Big decisions for you, it's a trying enough time anyway, without the added thoughts of trying to do what's best for twins. It's probably worth keeping an open mind and seeing how it goes, with a view to swapping over which ever option you decide on, if it doesn't work out. Good luck to you and the boys, they certainly look happy in their uniforms. Thank you x It is odd, that I have an expectation on the school to understand their characters- when we do treat them as individuals as a pair- but I do look forward to hearing how they get on in this new environment. It's early days (day 2!) and we are finding this- we're thinking of different hair cuts too just to try and differentiate a bit more. It is so odd! In some photos they are so obviously different... and yet in reality!! It's odd, we panic, we mull over, and yet, things do seem to work out. Rickets - poverty, diet or sunshine?